Today’s sound physical education programs are designed to help each child reach their individual potential in motor skill development, fitness, play and movement concepts. The most outstanding programs also provide opportunities for learning competency, sportsmanship, understanding and personal responsibility. The goal is not the activity itself but rather the complete development of the child. SNAG® is a modified golf game created to be an important and essential part of the physical education curriculum. But its benefits do not stop there. Because of its design and adaptability, it can aid in teaching academic concepts in the classroom, as well as develop the important life skills that are often missing from today’s educational system. This is why SNAG® Golf has developed the iPE™ School Program. More than just a game, SNAG’s iPE™ School Program K-5 curriculum offers teachers an opportunity, in a single activity, to meet many of the standards set by the National Association of Sport and Physical Education (NASPE). The physical education programs which are the most educationally sound contain objectives in the three domains of student learning: Psychomotor (physical skills), Cognitive (knowledge of concepts, rules and strategies), and Affective (emotional well-being). The iPE™ School Program curriculum includes objectives in each of these three domains, as well as ideas for academic integration. All three of these areas are important for successful development of the whole child in physical education. What further makes the SNAG® iPE™ curriculum unique is the Life Skills section that addresses the emotional health issues of the students in each lesson, kindergarten through fifth grades. Setting boundaries, making decisions, resolving conflicts and managing stress are just a few of the affective objectives detailed for each “Life” lesson. Basic concepts such as personal behavior, decision-making, appreciation and consideration are focused on in the K-2 years, while more advanced concepts are explored in the grade 3-5 years. The availability to incorporate academic lessons within the curriculum makes SNAG’s iPE™ School Program a valuable tool to support classroom learning. SNAG® can be used to help teach concepts in mathematics, English and literature, social studies, geography and science. 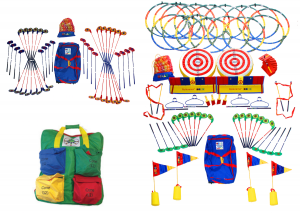 The SNAG® iPE™ School Program curriculum includes lists and descriptions of games that can enhance instruction in all of these subject areas. In addition, the mere playing of the game itself helps students develop creativity and understanding of spatial relationships by learning to design their own holes (called Stickys). For Ed Pros with approved status, the iPE™ Instructional Video and Elementary Lesson Plans are available as a free download through the online store. Ed Pros also have the opportunity to register through the site for upcoming iPE™ webinars as they come available. It has been said that the game of golf is a microcosm of life itself. The sport, more than any other, truly reflects the well known adage, “It’s not whether you win or lose. Its how you play the game. Golf’s dependence on the integrity of the individual is responsible for solidifying the character of the millions who have played it. Unfortunately, this character- building sport has rarely, if ever, been effectively offered as a curriculum option in the world’s school programs. Until now. Developed by former PGA Tour players Terry Anton and Wally Armstrong, SNAG® provides an excellent entree for kids into the game of golf, beginning at the earliest stages of the educational system. The SNAG® curriculum, incorporates the teaching of all-important academic parallels and life skills that will not only make better students, but better human beings and more solid citizens.